With gloves on, dip the fish into Greek yogurt, scraping off all but a thin layer. Place fish into the crushed honey chipotle pecans to coat. Refrigerate until ready to bake. In a medium saucepan combine carrots, milk, garlic, turmeric, smoked paprika, chili powder and salt. Allow to simmer on low heat for 20-30 minutes or until the carrots are fork-tender. Place mixture in the blender and add honey; puree until smooth. Hold refrigerated until used for service. In a one gallon cambro, whisk together the lemon juice, olive oil, honey, salt, and pepper. Add kale and Israeli couscous; and toss to coat in liquid ingredients. Let marinate for at least one hour before serving. Bake fish for 8-10 minutes, or until cooked through. Warm carrot puree and spread ½ cup on the plate. 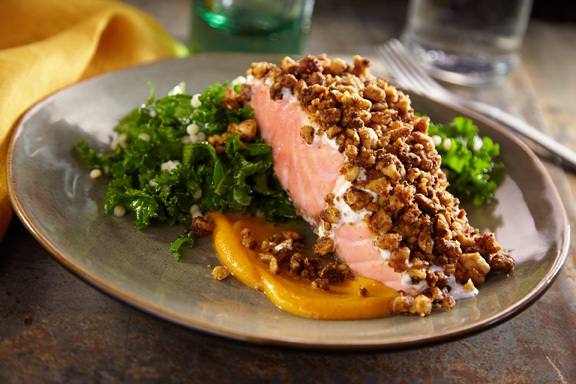 Top with 1 cup of the Marinated Kale and Couscous and one Honey Chipotle Pecan Crusted Salmon. Serve immediately.